Southeast Asian Governments Are Making It Rain in the Officers Club; does it mean dark clouds on the horizon, or is there a silver lining? The 2013 defense budget for China’s People’s Liberation Army (PLA) was more than eight times the size of its budget in 2000, and while Southeast Asian states cannot possibly match this spending explosion, they are doing their best to develop modern forces capable of defending their territory and their claims to maritime resources. Some argue that this trend may lead to armed conflict in the region. However there may be a silver lining to this seemingly perilous build up of arms; through proper management of their defense buildup, Southeast Asian states can strengthen their economies by creating a stable security environment to encourage investment, investing in infrastructure and manufacturing, acquiring advanced technologies, and developing their vast untapped human capital. 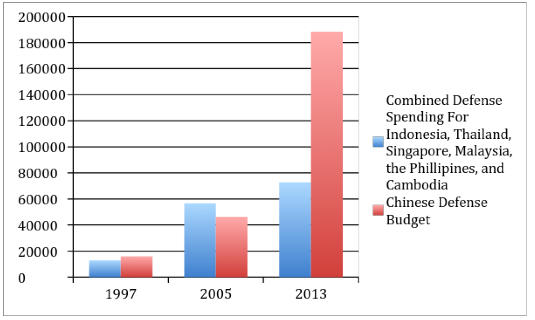 Combined spending on the defense budgets of Indonesia, Singapore, Malaysia, the Philippines, Cambodia, and Thailand have more than quadrupled since 1997 as these countries have scrambled to acquire modern equipment (Figure 1). The amount that Vietnam spends on defense is a closely held state secret, an utter shock for a government so renowned for its openness, but it is estimated that the budget of the People’s Army of Vietnam (PAV) quadrupled between 2003 and 2013. Asia as a whole is poised to begin spending more on defense than Europe for the first time since the crusades, give or take a couple centuries. The huge reserves of unexploited offshore resources in the region are a central driver of the buildup. All of the afore mentioned states, along with the tiny Kingdom of Brunei, have a mishmash of conflicting claims in the South China Sea, the Gulf of Thailand, and other maritime bodies in the region, based on competing historic claims and interpretations of maritime laws pertaining to exclusive economic zones (Figure 1). Looming large over all of these claims is China’s “nine-dashed line” with which the People’s Republic lays claim to almost the entirety of the South China Sea. By most accounts the nine-dashes are based on a map drawn up by the nationalist Kuomintang government in the late 1940’s after the Japanese withdrew from the area. As recently as the 2014 Shangri-La security summit Chinese officials have made references to the territory of the 3rd century Han dynasty as the basis for its claims. The nine-dashed line is by far the most belligerent and outlandish territorial claim by any state in the region, and it is the biggest single contributor to the explosion in regional defense spending. The government of the Republic of China also claims the territory within the nine-dashed line, and although the author has been known to be wrong from time to time he wouldn’t advise any bets on Taiwan posing a regional security threat any time soon. The buildup of Southeast Asian militaries appears to be unavoidable as the region realizes that they can no longer rely on the United States for all of their security needs. These efforts can be a major contributor to development if they are directed in the right direction to avoid the many potential pitfalls. Will the sources of economic investment please stand up? Current trends in Southeast Asian defense spending show no signs of letting up. While government spending in other areas may be better for development, the motivation to modernize their armed forces has given defense spending the priority. The conventional wisdom among economists is that defense spending is a complete drain on an economy of a developing state based on the notion that it does not contribute to investment. Investment is widely recognized as perhaps the most important factor in the economic growth of a developing country. At the risk of recycling an overused analogy, spending on consumption can be viewed as the fuel for the car that is the economy. Things paid for by investment, like factories and infrastructure, are often more important than consumption because they form the engine that actually moves the car. The notion that that defense spending is a complete loss for a developing economy is based on the view that defense spending contributes very little to consumption and almost nothing to investment which is simply not the case. There are numerous ways money spent on defense can be considered investments. Much of the data that academics use as evidence for their conclusions fails to account for what military budgets in developing countries are actually paying for. It instead looks only at connections between spending levels and macroeconomic indicators, a connection, which is questionable at best. Such studies often look at data from the mid-to-late 20th century during a time when most countries that are now considered developing weren’t experiencing much in the way of development. It should be noted that while the dollar amount and per capita defense spending has increased across the Southeast Asia since 2000 it has declined as a share of government spending and GDP in all countries with the exception of Indonesia, which is in the process of weaning its armed forces off of funding military owned businesses. To put it simply, the spending increases are going to happen no matter what. The real question is; how can these countries channel their defense spending increases in a way that is good for their development? A stable security environment is key to attracting business for countries hungry to fund their development. Businesses simply will not want to set up shop in a country if they face the threat of organized criminals, pirates, or insurgents with political goals. The region continues to struggles with piracy due to the massive amount of maritime trade that transits through narrow waterways, most notably the Strait of Malacca jointly controlled by Singapore, Indonesia, and Malaysia. Unfortunately statistics are unavailable on how much Bacardi transits through the region, which may be the key to explaining regional piracy. Both communist, ethnic nationalists and Islamist rebel groups continue to be active throughout the region, especially in the Southern Philippines, Southern Thailand, and Indonesia. Stronger militaries can help states combat these ongoing threats continue to hamper regional development. Businesses looking to invest in a developing country especially don’t want to set up shop where they risk being ousted from their offshore operations by the Chinese navy. By investing in modern militaries, Southeast Asian countries can deter Chinese aggression in their territorial waters. China has focused on a developing warfare doctrine known as anti-access/area denial (A2/AD). Not to be confused with Luke Skywalker’s robot companion, A2/AD allows an inferior military to achieve victory, or at least force a stalemate, against a superior foe by focusing efforts on capabilities, like stealthy submarines and modern air defense systems that keep the superior force from operating where it needs to. While China’s efforts are directed at preventing the United States from intervening in the event of a conflict with a neighbor, other states can learn from China. Southeast Asian states can develop forces that would make it too costly for China to use force in pursuit of its maritime claims. By doing so they can force China to settle disputes peacefully, thereby guaranteeing a stable security environment for business. Like fifty told you, go ahead and switch the style up and watch the defense investment pile up. Past defense acquisitions by Southeast Asian states generally came in the form of purchasing hardware manufactured by NATO members or the Soviet Union, but at a complete loss for their investment starved economies. There was a certain practicality behind this, as Southeast Asia simply didn’t have the industrial capacity to manufacture sophisticated aircraft, large vessels, and other weapons systems. Now that Southeast Asia has a rapidly growing industrial base and a more friendly regulatory environment than the West, a new model of acquisition is being used ever more frequently that allows for some of the most modern hardware to be built locally. Most western defense budgets have steadily declined in recent years and defense firms in those countries have begun to look for new markets. Their eyes have turned towards the business friendly shores of Southeast Asia, resulting in numerous exchange partnerships between regional and western firms that allow Southeast Asian states to build licensed western systems locally. Indonesia recently signed a deal with a Korean company that allowed two new Korean designed amphibious warfare vessels to be built at the Indonesian PT PAL shipyards in the city of Surabaya on Java (see cover photo). The French shipbuilding giant DCNS has set up joint ventures with Singapore’s ST Marine to build six stealth frigates and with Malaysia’s Boustead Heavy Industries to build two Scorpène-class submarines for the countries respective navies in local shipyards. Some developing countries that have contracted with western firms have even been able to build western designed hardware for export. Although there have been few notable examples in Southeast Asia itself, Korean companies recently signed deals to export German designed submarines to Indonesia and British designed replenishment ships to the UK and Norway. The opportunities for employment in the defense industry will continue long after the manufacture of these ships as they will require a large effort to maintain, repair, and upgrade throughout their lifetime. Defense spending can also translate into growth friendly investment in the country’s ports, communications networks, airports, and other infrastructure for strategic purposes or to facilitate the expansion of industry. You might see them in their brand new ships. Apart from investing in their manufacturing industries and infrastructure, by partnering with foreign defense firms Southeast Asian countries can also benefit through the transfer of advanced technologies, both for military and civilian uses. The acquisition process often includes education and training on how to build and employ advanced technologies, which can lead to both replication and independent development of new technologies for the defense and civilian sectors. A central goal of the Chinese cyber espionage program is to steal designs of advanced technology for military and civilian use from the west. However, it takes more than a blue print to manufacture, assemble, and properly deploy complex technology. Simply put, a team of Chinese government hackers in Shanghai isn’t going to enable China to replicate the fifth-generation American F-35 fighter with a few keystrokes. Southeast Asian states have the potential to leap ahead of China in many areas by making the financial investment in technology transfer agreements. Through this acquisition of technology and skills Southeast Asian companies and firms can develop proprietary designs for domestic use or export. Singapore became a shining example of this process when in 2012 ST Marine beat out competition from Dutch and Indian companies for a $703 million contract to build four offshore patrol vessels for the Royal Navy of Oman. Observers expect Southeast Asian defense exports to go nowhere but up as cooperation with foreign firms bring skills and technology to the region. They started from the bottom, now they’re here. Human capital is arguably the most important element to the long-term growth of an economy, and well managed military spending by Southeast Asian states can play a key role in developing their human capital. Investing in a modern military can develop the professional skills of service members and civilians involved in defense manufacturing. It can also provide a robust safety net for service members, and take on the role of many of the ‘preferred’ spending alternatives, by providing housing, healthcare, funding primary and higher education for children, and pensions. Professionalized militaries have a long history of providing opportunity for people who are born into poverty in developed states and there is no reason the same cannot happen in developing countries. An unfathomable amount of talent is wasted in developing countries simply because there is no avenue available for people to develop their skills. By spending more on their military personnel, developing countries can provide an avenue to identify the best and brightest in their populations and shape them into a source of skilled human capital that strengthens national development. A major barrier to the positive impacts of defense spending is the rampant corruption present in many Southeast Asian governments and militaries. One example is the Indonesian armed forces’ (TNI) ownership of a vast business empire. However, this empire is the result of chronic underfunding of the TNI since the country’s independence. The funding starved TNI receives an estimated two-thirds of its income from its business ventures. The militaries of Thailand and Vietnam have similar funding mechanisms that create huge corruption issues in their countries. The problem can be alleviated through proper funding of the armed forces. It will allow governments to force the sale of these corrupt businesses by making militaries less reliant on the funds they receive from them. It will also make militaries more accountable to civilian government control, a key component of any robust democracy. Danger is not a stranger. Some argue that a military buildup in Southeast Asia will guarantee a future conflict that will be extremely harmful to the people and economies of the region. However this interpretation relies on a view of history that sees war as easily waged as it was in the centuries before 1945. The international order has become so intolerant of interstate wars that only a handful of major conflicts have been fought since the end of WWII and most have involved a significantly stronger state taking advantage of a weak neighbor. By developing a modern military, Southeast Asian states will the chance that they will be taken advantage of by China or another powerful neighbor. The United States will still play an important role in maintaining peace in the region but will be able to reduce its commitments. Rather than stationing regional forces capable of taking the fight to an aggressor, the US will be able to position smaller forces that act as a buffer between states who may want to settle a disagreement through force but won’t risk provoking the US to do so. A recent special report by the Economist proclaimed the dawn of an age of preeminence of states on either side of the Pacific. This perhaps is the most true of Southeast Asia, which is experiencing faster economic growth than any other region on the planet, and unlike China has the advantage of growing democratic institutions. It is clear that states in the region are going to spend money modernize their militaries to meet new security needs. What is important is that they direct their expenditures in a way that strengthens rather than slows their economic development. Posted in Economics, Geopolitics, Op-Ed, Politics, War/Conflict and tagged Arms, China, defense, defense industry, development, Economics, geopolitics, human capital, industry, investment, Military, Southeast Asia, strategic, technology. Bookmark the permalink.